Choose the package that best fits you and your vehicle. Simply have your driver’s license, vehicle make, model and license plate number available when you sign up. The Greeter will scan your vehicles registration sticker, which will allow our Car Wash Greeter to track your vehicle and package information. The greeter will provide you with a PAID receipt. The scanning of your vehicles registration sticker allows for an easy transaction. Therefore, there is no need to show your ID or credit/debit card at check out as your information is securely retained on file for this purpose only. Applying… Choose the package that best fits you and your vehicle. Simply have your driver’s license, vehicle make, model and license plate number available when you sign up. The Greeter will scan your vehicles registration sticker, which will allow our Car Wash Greeter to track your vehicle and package information. The greeter will provide you with a PAID receipt. The scanning of your vehicles registration sticker allows for an easy transaction. Therefore, there is no need to show your ID or credit/debit card at check out as your information is securely retained on file for this purpose only. Payment… Choose the package that best fits you and your vehicle. Simply have your driver’s license, vehicle make, model and license plate number available when you sign up. The Greeter will scan your vehicles registration sticker, which will allow our Car Wash Greeter to track your vehicle and package information. The greeter will provide you with a PAID receipt. The scanning of your vehicles registration sticker allows for an easy transaction. Therefore, there is no need to show your ID or credit/debit card at check out as your information is securely retained on file for this purpose only. Registration Sticker… Choose the package that best fits you and your vehicle. Simply have your driver’s license, vehicle make, model and license plate number available when you sign up. The Greeter will scan your vehicles registration sticker, which will allow our Car Wash Greeter to track your vehicle and package information. The greeter will provide you with a PAID receipt. The scanning of your vehicles registration sticker allows for an easy transaction. Therefore, there is no need to show your ID or credit/debit card at check out as your information is securely retained on file for this purpose only. Terms & Conditions… Choose the package that best fits you and your vehicle. Simply have your driver’s license, vehicle make, model and license plate number available when you sign up. The Greeter will scan your vehicles registration sticker, which will allow our Car Wash Greeter to track your vehicle and package information. The greeter will provide you with a PAID receipt. The scanning of your vehicles registration sticker allows for an easy transaction. Therefore, there is no need to show your ID or credit/debit card at check out as your information is securely retained on file for this purpose only. Wash Packages… Choose the package that best fits you and your vehicle. Simply have your driver’s license, vehicle make, model and license plate number available when you sign up. The Greeter will scan your vehicles registration sticker, which will allow our Car Wash Greeter to track your vehicle and package information. The greeter will provide you with a PAID receipt. The scanning of your vehicles registration sticker allows for an easy transaction. Therefore, there is no need to show your ID or credit/debit card at check out as your information is securely retained on file for this purpose only. Benefits… Choose the package that best fits you and your vehicle. Simply have your driver’s license, vehicle make, model and license plate number available when you sign up. The Greeter will scan your vehicles registration sticker, which will allow our Car Wash Greeter to track your vehicle and package information. The greeter will provide you with a PAID receipt. The scanning of your vehicles registration sticker allows for an easy transaction. Therefore, there is no need to show your ID or credit/debit card at check out as your information is securely retained on file for this purpose only. Cancellation… Choose the package that best fits you and your vehicle. Simply have your driver’s license, vehicle make, model and license plate number available when you sign up. The Greeter will scan your vehicles registration sticker, which will allow our Car Wash Greeter to track your vehicle and package information. The greeter will provide you with a PAID receipt. The scanning of your vehicles registration sticker allows for an easy transaction. Therefore, there is no need to show your ID or credit/debit card at check out as your information is securely retained on file for this purpose only. The day you sign up becomes your monthly payment date for each consecutive month you are in the program. No hassle and no fuss! (CREDIT/DEBIT CARD REQUIRED) Membership fees are automatically billed to your credit/debit card every month until such time as the agreement is terminated by you or Ultra Sonic Express, Inc.
Can I use my unlimited pass with more that one vehicle? No, the program is vehicle specific and limited to the vehicle that corresponds to the license plate number on the account. If you wish to transfer your Unlimited Wash Program to a new vehicle, please present the Car Wash Greeter with your new vehicle make, model and license plate number. The Car Wash Greeter will re-verify your credit/debit card information. What if I sign up for the Monday - Thursday program on a Friday, Saturday or Sunday? As a one-time courtesy, you will receive a 25% discount for your current wash.
What if I am in the Express Exterior only program, but want to get the Ultra Sonic wash that day? Simple. Just pay the difference between the two packages. For example, if you would like the Ultra Sonic Exterior wash but are a member of the Express Exterior wash program, you would only pay the difference in price (i.e. $15.95 – $9.95 = $6.00 plus tax due). What if my credit/debit card expires or is no longer valid? Unlimited Wash Program members MUST present the Car Wash Greeter with the updated contact and billing information. In the event Ultra Sonic Express, Inc. is unable to charge a member’s credit/debit card, the member’s program will be de-activated immediately. 1. You may “terminate” your account at any time, which inactivates your membership immediately. If it is in the middle of your billing cycle, you will receive a partial refund for the unused days of this current cycle. 2. You may also “discontinue” your account at any time. This allows you to continue using your membership for the remainder of your current billing cycle. Your credit/debit card will not be recharged at the end of the cycle, thus making your account inactive at that time. Please note that you may choose the “discontinue” option ONLY if your credit/debit card has been recharged at least one time. This option will not work for those that have had their membership for less than one month. For your protection, we DO NOT allow cancellations by phone. UNLIMITED* Membership allows one (1) wash per day. Membership is per vehicle and for “personal use only.” It is not transferable to another individual or vehicle. Oversized SUV’s, Vans & Trucks will be charged an additional surcharge, regardless of which package is purchased. Taxis, Limousines and other professional vehicles will be charged an additional surcharge, regardless of which package is purchased. The Unlimited Wash Program cannot be combined with any other programs or discounts including, but not limited to pre-paid washes, passes, and/or coupons/promotion. Ultra Sonic Express, Inc. reserves the right to close due to inclement weather, major holidays,equipment failure or by any other cause beyond our reasonable control. Therefore, in these circumstances, the computer system will NOT ALLOW Unlimited Wash Program Members access to washes on any other day. i.e. If your membership is Monday – Thursday and Thursday is closed due to weather/maintenance/etc., your membership will NOT be recognized until the following Monday. Therefore, should you choose to wash your vehicle on a day that is not included in your package, you will be charged FULL PRICE. Ultra Sonic Express, Inc. will post notice, on site, 30 days in advance of any/all changes in the price or services offered to the Unlimited Wash Program. 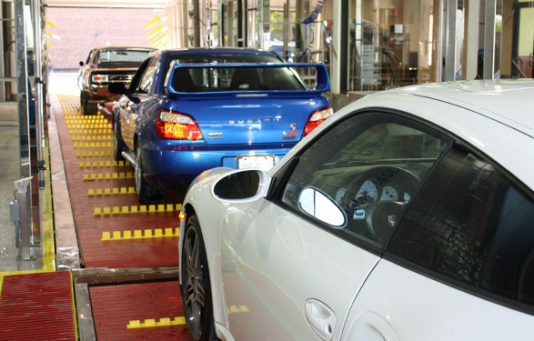 Ultra Sonic Express, Inc. retains the right to discontinue any customer’s participation in the Unlimited Wash Program.